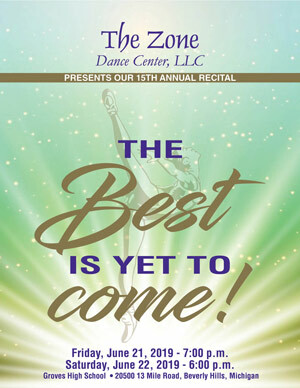 Join us in celebration of our 15th Annual Recital, "The Best is Yet to Come!". Friday, June 21, 2019 at 7:00 p.m. and Saturday, June 22, 2019 at 6:00 p.m. Performances are held at Groves High School, 20500 W 13 Mile Rd, Beverly Hills, MI 48025. Door open 1 hour before the show. Reserved seating tickets can be purchased online beginning Friday, April 12th. Tickets $20 in advance and $25 at the door. Please consider supporting our 2019 Lawrence C. Perry Scholarship by purchasing an ad in our 2019 Souvenir Ad Book. The 2019 Souvenir Ad Book is a fundraiser, benefiting the Lawrence C. Perry Scholarship Program. The scholarship program is designed to meet the financial and artistic needs of gifted students who love to dance and have a desire to excel in the performing arts. Deadline is Friday, April 26th. 21	15th Annual Recital Show #1 7 PM Groves H.S. 22	15th Annual Recital Show #2 6 PM Groves H.S. Monday-Friday 4:30-8:00 • Sat. 9:00-5:30 pm.